Your mind can be humming along for hours like an idling motor UNTIL you want to concentrate on one thing. Tell your mind to settle down so you can study and meditate on God’s Word and it invariably decides to rev up and throw a party. What’s for dinner pops in. Followed by, did I take the dryer off that cotton setting when I transferred the last load? And, will I remember to write that note for school – oh well, better do it NOW before I forget. How much longer can the car go without a tune-up? I hope I won’t show my nervousness tomorrow in my performance appraisal at work. ETC!!! We are constantly told of the value of having a daily quiet time but we secretly wonder if everyone else’s is as noisy as ours. When we can’t concentrate we give up easily and often settle for a verse of two of Psalms and a generic “bless my day Lord” as we run to our hectic work schedule. I have found two things that work for me when my mind is racing around acting like it has Attention Deficit Disorder. Both techniques involve pencil and paper. Number one is to handle all the competing thoughts vying for attention. It’s nearly impossible to force them to leave so instead, make provision for them as they crowd in. If the thought pops up that you need three items at the store on the way home, go ahead and jot them down. Once written down, you can dismiss the thought. You can even write a list of things to think about later in the day after your designated quiet time. 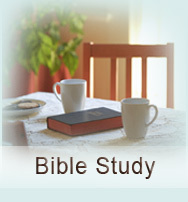 Now that your mind is unsuccessful at interrupting you, you are free to start studying some portion of God’s Word. It’s a good idea to pick a book or subject that you are going to study through rather than randomly saying each morning; “Gee, what should I read today?” Here again, pencil and paper will be a great help. Writing the scripture out works wonders settling your thoughts into it. I don’t know why that’s true but I have found that it is. Some thought or question regarding the verse will often follow and you should write that down too. Now answer it – either out-loud or again, written out. If you are using a Study Bible, use any helps and look up any cross references available regarding that verse or passage. For instance, one of my Bibles refers me to Deuteronomy 11:24 when I read Joshua 1:3. Going back to that passage will give me more spiritual food to chew on which is what meditating really means anyhow. You might wonder is this method of study won’t be pretty slow. Yes, but who cares? You don’t get extra points from God for finishing his Word in the quickest time. Rather, even if slow, the deeper your mind, heart and spirit sink into a passage, the more real progress you will make.